Malmo Sturup International Airport (MMX) lies approximately 28 km / 17 miles from the city of Malmo and is Sweden's third-largest airport. A large number of annual visitors with both leisure and business agendas fly into Malmo, putting some pressure on the city to provide quality accommodation for all. The airport itself features an excellent hotel, while there are a good many more lodgings in the surrounding region. The Best Western Sturup Airport Hotel is located nearby Malmo Airport and boasts excellent conference facilities for companies and a range of business facilities for resident business guests. A modern hotel with more than 60 guest rooms and six large conference rooms, the Best Western also offers a restaurant, gymnasium and outdoor swimming pool. There are many surprisingly good-value hotels in the city of Malmo, located close to the coastline and priced to attract tourists and visitors all year round. The Malmo Tourist Information Office at the Central Station can assist with those looking for accommodation, offering a convenient booking package during the summer months, which includes a Malmo Card (Malmokortet). This card provides free access to a number of city museums and other attractions, such as guided bus tours and public transport. Accommodation in Malmo comes in all shapes and sizes, with the lower end of the market including two youth hostels, both with dormitory beds and separate rooms. The city's main hostel is the STF / HI Youth Hostel along Backavägen, located around 3 km / 2 miles south of Malmo city centre. 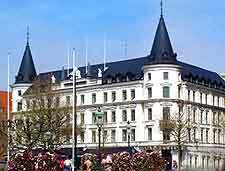 Popular mid-range accommodation in Malmo includes the Astoria along Grabrodersgatan, the Ramada Mayfair City Centre Malmo Hotel on Adelgatan, and the Comfort Hotel along Carlsgatan - close to the train station. Also worth mentioning is the stylish Elite Savoy Hotel on Norra Vallgata, which is known for its elegant surroundings, waterfront views and affordable prices.